Openinghours: Wednesday - Sunday 12 - 8 p.m.
Stedelijk Museum Bureau Amsterdam – in cooperation with the new project space for art, design and architecture at the Looiersgracht 60 – proudly presents Lard Buurman - Africa Junctions. 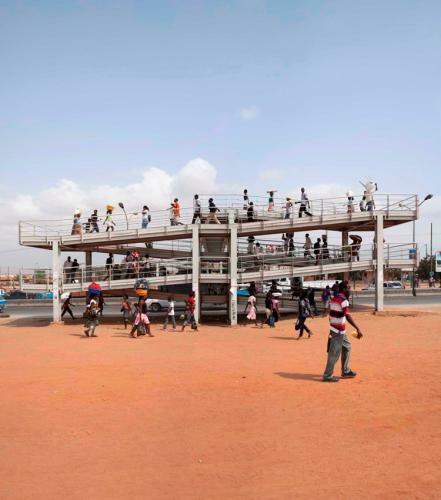 The exhibition is the result of the photographic project on African cities that Lard Buurman (b. 1969, Netherlands) started in the spring of 2008. Now, six years later, this project has been completed and crowned with the publication Africa Junctions. Capturing the City, published by Hatje Cantz Verlag, including three essays by distinguished writers from Senegal, Nigeria and South-Africa, and an exhibition organized by Stedelijk Museum Bureau Amsterdam, in the premises of Looiersgracht 60, Amsterdam. For Africa Junctions Lard Buurman visited 14 cities in 12 countries on the continent of Africa over a period of six years. Buurman is interested in everyday life on the streets of the cities: their residents, their lives, and how they utilize public space. The human body, the movement of individuals and groups constantly create a choreography in Buurman’s urban photographic portraits, so that he becomes not only a portraitist of the fleeting urban moment, but also its director through his careful composition of the images. Buurman allows the viewer to feel the movement of the city in still images, so that they become a metaphor for the variability and flexibility of the city and its inhabitants. African cities are complex cities: overflowing with people, chaotic and largely growing unplanned from the periphery. To our western eyes they very quickly seem dangerous and dysfunctional. Lard Buurman however reveals the true nature of the African city: a ‘normal’ city, without drama or violence. Daily life there is improvised on the street. Public and private spaces flow into each other: the pavement can also be a street restaurant or a shop; a traffic jam can mean a delay for some people, but is a lucrative source of income for others. The city does function. Lard Buurman's photos not only give us another perspective on Africa, but also on the concept of ‘documentary photography’. Buurman constructs his photographic images from dozens of different snapshots from the same perspective. This is still often regarded as a taboo in documentary photography, while in Buurman's eyes every photo is a manipulation of reality. With this new, hybrid form of ‘cinematic photography’ Buurman seeks to capture the everyday realities of the place rather than the reality of the moment. The book Africa Junctions. Capturing the City contains over eighty photographs. 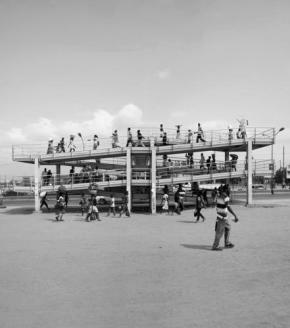 Essays by authors who reflect on the African city and the way in which Lard Buurman works are included with the photos. These contributions include texts by the Senegalese curator N’Goné Fall, the Nigerian author Chris Abani, the South African architect/artist Alexander Opper, and an interview with Lard Buurman by Chris Keulemans. The book is designed by Roosje Klap, edited by Nina Folkersma, and published by Hatje Cantz Verlag. The book receives its public launch on Wednesday, 23 April, during a discussion programme. The names of the participants in the discussion will be announced at a later date. The exhibition Africa Junctions is being organized by SMBA, the project space of Stedelijk Museum Amsterdam, in collaboration with Looiersgracht 60, a new project space for contemporary art in Amsterdam. The exhibition and book launch will take place in the premises of Looiersgracht 60, Amsterdam. Simultaneously with the exhibition in SMBA/Looiersgracht 60, Amsterdam, there will be an exhibition by Lard Buurman in CBK ZuidOost, with six photos in public spaces in the Zuidoost.